Dinkelbrot for sale. Buy online at Zingerman's Mail Order. Gourmet Gifts. Food Gifts. One hundred percent spelt grain loaf made with loads of sunflower seeds. 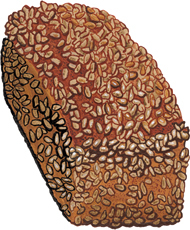 Dense, moist, delicious, different from most of the breads we bake whose origins tend to be French and Italian. It's great for sandwiches. I've been devouring loaves with only some good butter and sometimes the help of a toaster. "My Dinklebrot was the hit of my church's fellowship coffee hour today as we did 'Breads from Around the World' as our refreshment theme. In fact, my platter was the first to be empty!"